A majority of Georgians would support measures meant to improve gun safety. That's the biggest takeaway in a new exclusive poll from 11Alive and SurveyUSA. 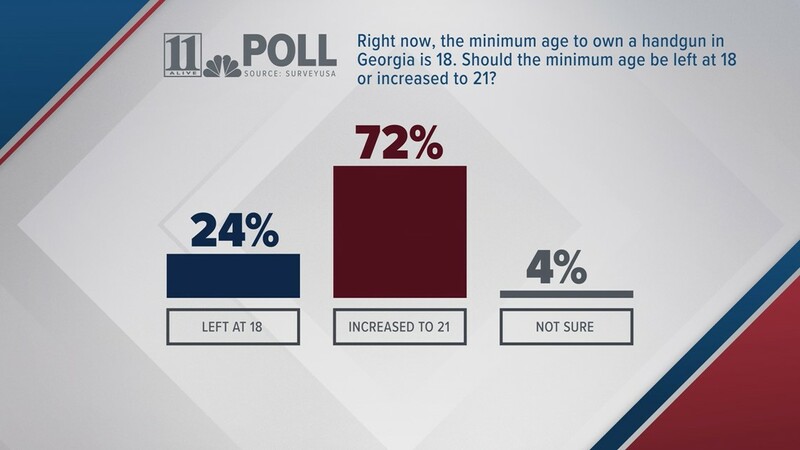 ATLANTA — According to the results of the poll, an overwhelming number of Georgians – 72% to be exact – support the idea of raising the minimum age of gun ownership from 18 years old to 21. Only 24% say the age requirement should remain where it is. Four percent were unsure of making any changes. 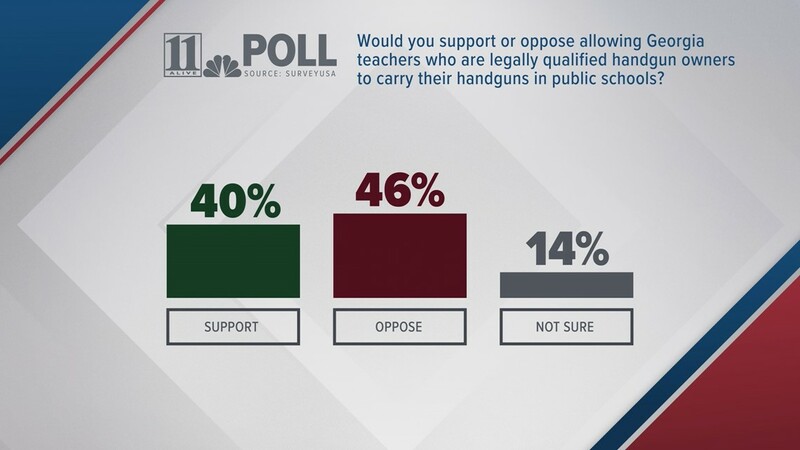 When it comes to allowing teachers to carry guns, Georgians were a little more evenly split about supporting the idea. Only 40% support arming teachers in public school, whereas 46% oppose the idea. Fourteen percent of those surveyed were unsure about the move. In Georgia, multiple school districts already have passed measures arming teachers. The survey also asked whether Georgians would support a ban on assault-style rifles, like the AR-15. A slim majority – 51% – said they would support a ban, while 37% reported they would oppose a ban. Meanwhile, 12% responded they were unsure of banning those types of weapons. 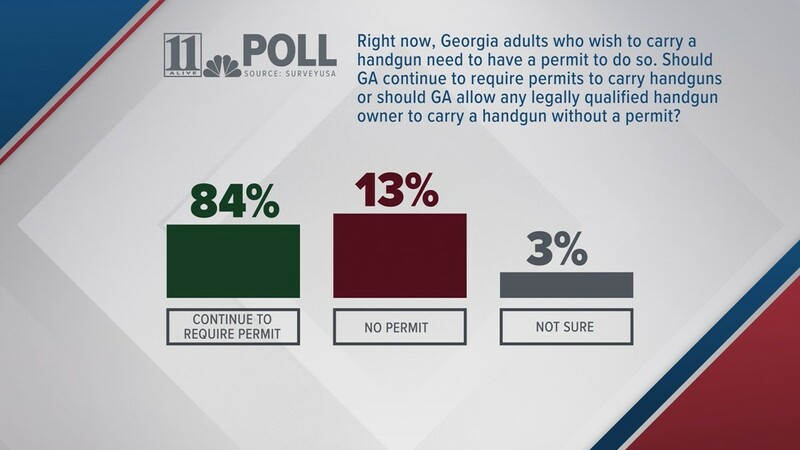 Regardless of the age or occupation of a person carrying a gun, a majority of Georgians – 84% – still believe that permits should continue to be required for anyone wanting to carry a handgun. That's compared to 13% who say that any legally qualified owner should be allowed to carry a gun without a permit. A mere 3% were unsure. 1. Right now, the minimum age to own a handgun in Georgia is 18. Should the minimum age be left at 18? Or increased to 21? *Credibility Interval for this question = ± 2 percentage points. 2. Right now, Georgia adults who wish to carry a handgun need to have a permit to do so. Should Georgia continue to require permits to carry handguns? Or should Georgia allow any legally qualified handgun owner to carry a handgun without a permit? *Credibility Interval for this question = ± 1.6 percentage points. 3. Would you support or oppose allowing Georgia teachers who are legally qualified handgun owners to carry their handguns in public schools? *Credibility Interval for this question = ± 2.2 percentage points. 4. Would you support or oppose a ban on assault-style rifles such as the AR-15?